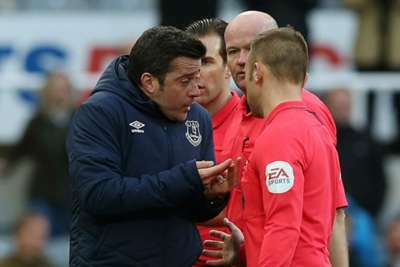 Marco Silva has been handed a £12,000 fine by the Football Association (FA) after the Everton boss confronted referee Lee Mason and his assistants following the loss to Newcastle United. Everton lost the Premier League match 3-2 at St James' Park on March 9 having led 2-0 at half-time, with Silva livid that Ayoze Perez's late winner was allowed to stand despite suspicions of offside. Silva came onto the pitch after the final whistle to remonstrate with Mason and the other officials, an act that resulted in an improper conduct charge, which he accepted. The FA confirmed on Tuesday that, following an independent regulatory commission hearing, Silva had been fined £12,000 but had escaped a touchline ban. Earlier this month, Tottenham manager Mauricio Pochettino was given a two-game touchline ban following his own heated exchange with referee Mike Dean at Burnley.